Home BUSINESS Kiambu poultry farmers form society to solve challenges choking the sector. Kiambu poultry farmers form society to solve challenges choking the sector. Thika Town MP Eng. 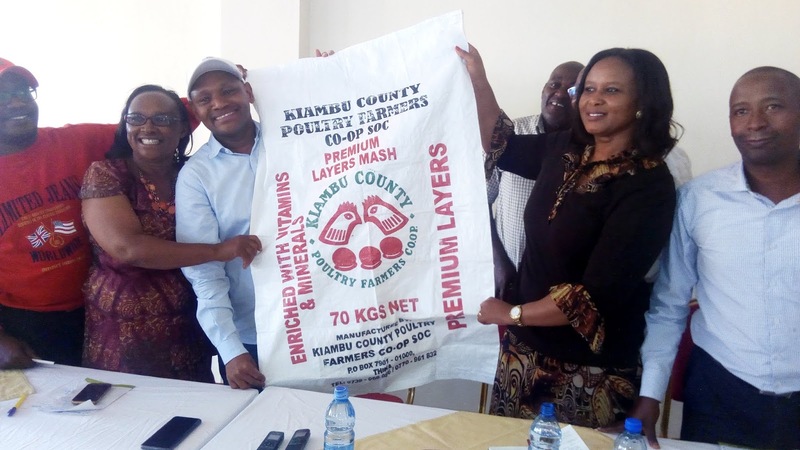 Patrick Wainaina and his Gatundu North counterpart Wanjiku Kibe join members of Kiambu County Poultry Farmers Co-operative Society in celebrating the success of their first poultry feeds production. Poultry farmers in Kiambu County have formed a co-operative society to help them solve the challenges that have been stifling the poultry industry in the country and driving most of them into bankruptcy. While speaking during the launch of Kiambu County Poultry Farmers Co-operative Society in Thika, founder member Zachary Waweru Munyambo said that the society was formed to address the common challenges they faced to enable them effectively compete in a market that was currently flooded with cheap poultry products. “We saw the need to come together to enable us speak in one voice and collectively tackle our common challenges such as the high cost of production and the unavailability of ready markets to our products,” he explained. Among the numerous challenges they faced, the farmers cited the influx of poor quality poultry feeds in the market that were sold at high prices. This they noted, affected the production and quality of their eggs and meat thus making poultry farming an uneconomical venture. They also said that some of the ingredients used by some of these manufacturers exposed their chicken to diseases and other health complications. “We also face a very big challenge with the middlemen who buy our eggs at throw away prices due to our vulnerability. The police and county government enforcement officers are another very big hindrance to our growth as the subject us in all manner of harassment in the guise of checking public health precautions,” explained Paul Kamau, a poultry farmer from Juja sub-county. The farmers also cried foul about the poor services they received from the veterinary officers which at times resulted to some of them losing their entire flock of birds. However, barely three months after registering their association, these farmers have now started manufacturing their own chicken feeds that is retailing at Sh. 2,500 per a 70kg bag of layers mash, sh. 300 less than what the other manufacturing are selling. They say that their feeds has improved egg production by about 1.5% and they were hopeful that with time, they will continue improving on quality and work out more cost effective measures that will eventually scale down the cost of the feeds to the bare minimum. Thika Town MP Eng. Patrick Wainaina however challenged them to think outside the box and begin their own hatcheries, feeds manufacturing plants and slaughterhouses to enable them effectively compete for the East African market. He donated an incubator capable of hatching 1,000 chicks and promised to give them a feeds mixer once they started their own feeds manufacturing plant. “Instead of lamenting about these challenges you are facing, you should instead view them as opportunities that call for exploitation. Don’t restrict yourselves to just poultry feeds production. Think big. Start making all animal feeds. Hatch your own chicks and even employ your own vets. This way you are guaranteed of quality and improved sales,” Wainaina challenged the farmers. He promised to help them in the logistics necessary for the success of their business including availing funds for growth and improvement. His Gatundu North Counterpart Wanjiku Kibe challenged the farmers to start thinking about value addition to both the poultry meat and the eggs so as to beat the market. “This is your chance to dictate the market. Seize every business opportunity that is related to poultry farming to kick out middlemen who are currently taking advantage of your vulnerability. You can even start your own hotel to sell your value-added poultry products and also contract some farmers to grow corn for your own raw materials so as to cut production costs,” said Wanjiku. She appealed to the Executive through the Ministries of Agriculture and Trade to cancel all permits allowing traders to import poultry produce from overseas. “These are the people killing the poultry industry with these cheap and at times substandard products,” she said. M-Pesa Foundation in court over contract dispute. Who is this new IG of Police, Hilary Mutyambai?